Seven women who are embracing their own unique beauty and proving that behind their "pretty faces" is a powerful, intelligent, person. Women are too often judged by their appearance. We’re told that we're too fat, too skinny, too pretty to be smart or too old to be attractive. Many of us spend our entire lives trying to feel good enough (for ourselves and for others) and that's a dangerous thing because women are more than just bodies. That's exactly what Dove’s latest campaign, #MyBeautyMySay is trying to shed light on. It aims to foster a new generation of women whose beauty is a source of confidence and not anxiety. A generation that recognizes women as more than just their figures. To do that, Dove created a film that features real women who were judged by their outward appearance. Despite the obstacles they faced, they each pursued their own paths to success. 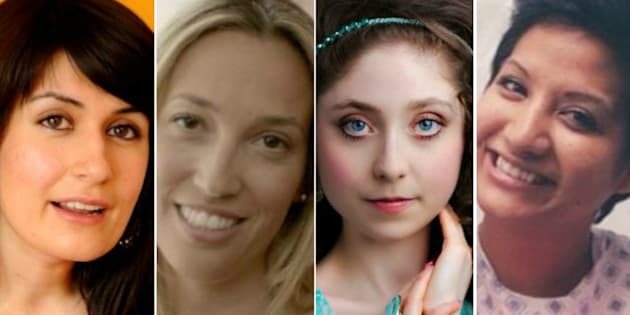 Inspired by their mission, we partnered with Dove to introduce you to six women who are embracing their own unique beauty and proving that behind their "pretty faces" is a powerful, intelligent, person. Ashley Callingbull is the first Canadian and the first Aboriginal woman to win the Mrs. Universe title. She may be famous for her extraordinary beauty, but she’s widely respected for her outspoken politics and advocacy work. After she took home the title of Mrs. Universe, she wasted no time using her platform to call out the Canadian government on its treatment of First Nations issues. Marcia was often seen as a woman with striking looks but who couldn’t possibly have the brains to match. She proved everyone wrong when she become a successful lawyer and has started her own law firm. It was this judgement, however, that made her excel in her field, proving to them that her looks have nothing to do with her capabilities. “They said…I was too pretty to be smart. I said…My looks have nothing to do with my skills," she said. Her story is featured in Dove's #MyBeautyMySay film, which you can watch here. Kelly Lovell is a young entrepreneur and speaker who is celebrated for her expertise in social innovation, marketing and business acumen. She's a two-time TEDx speaker, the Executive Producer and Host of YOU Effect TV and the CEO to Lovell Corporation. One of Lovell’s main points of focus is youth mobilization. She’s been outspoken about the misconceptions youth face today, saying that her generation is passionate and keen on making a difference in the world despite narratives that frame post-millennials as disengaged individuals. To fight these misconceptions and mobilize her peers, Lovell had launched the You Effect podcast that features inspiring stories from thought leaders. Deborah Gillis is the president and chief executive officer of Catalyst, a research and advisory organization working to change workplaces and improve lives by advancing women into business leadership. She started Catalyst Canada’s signature event, the Catalyst Canada Honours, a night that pays tribute to champions of women’s advancement to leadership roles in corporate Canada. Gillis has made coaching and mentoring of women in business and political life a personal priority. Far too often, women are discriminated against because they’re female. In the business world, for example, there’s a notion that women are less committed to their jobs which sometimes leads to women getting paid less than female employees without children -- a trend some researchers call the “mommy penalty.” “What we need to do is clear our heads of old notions and really celebrate the contribution that working mothers make to Canadian business," Gillis is quoted to say. Diagnosed with breast cancer at the age of 24, Agustin started blogging as a form of therapy and as a way to remind others that breast cancer isn’t only an older woman’s disease. After undergoing chemotherapy, a double mastectomy and radiation therapy, she’s now been in remission for two years and has raised thousands of dollars for the Run for the Cure fundraising event. This bright and vivacious young woman continues to help young cancer survivors via her blog and her many media appearances. “Having cancer was life-changing, but I didn’t want it to change me: the fun, active, social person, full of energy that I was known to be,” Agustin writes. That message resonates throughout her blog, particularly in a post about losing her hair and the struggle to feel beautiful. Even through that struggle, Agustin reminds others that it’s okay to feel this way at times and that attaining the feeling of flawlessness is just one Beyonce song away! Farrah has spent the last seventeen years working diligently to raise awareness of gender-based violence through art, education, counseling and community development. She is a nationally recognized public speaker and educator on violence against women. Farrah has co-created innovative community-centered initiatives such as Use the Right Words: Media Reporting on Sexual Violence in Canada and Outburst! Young Muslim Women Project, and was just named to the Advisory Council to help shape the Federal Strategy against Gender-based Violence. Much of her work is informed by her personal experience. As a woman of Dutch and Indian descent, Khan has been judged by the colour of her skin saying that “all women of colour are institutionally made to look like they are ‘the other.’” Her commitment to helping those who are marginalized and the serenity and kindness she conducts herself with makes her beauty shine through. Dove has found that beauty can (and is) an empowering and positive force for women. Yet women’s looks are often commented on in ways that trivialize them. The #MyBeautyMySay campaign and film sets out to change that and features stories of nine amazing women who stood up for their own beauty. You can watch it at YouTube.com/DoveCanada. Join the conversation and share your personal story on social media using #MyBeautyMySay. Learn more about the Dove Self-Esteem Project (DSEP), an online resource committed to improving the confidence of women and girls, at selfesteem.dove.ca.